Catch up the beginning of the Peter Parker saga with THE AMAZING SPIDER-MAN. Then, when Spider-Man’s enemies united in THE AMAZING SPIDER-MAN 2, Peter Parker finds that his greatest battle is about to begin. 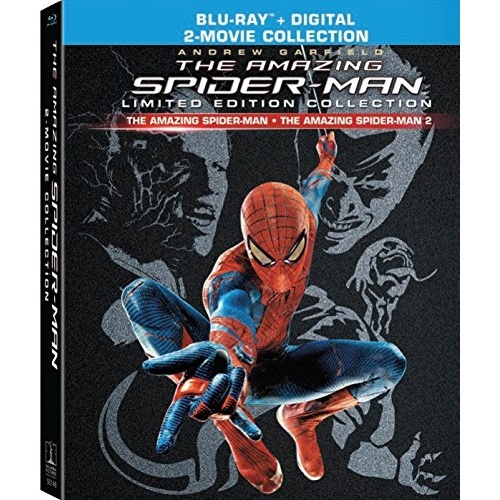 2017 Digibook Synopsis: The untold story of the legendary web-shooter unfolds in the blockbuster Amazing Spider-Man films, directed by Marc Webb. The saga begins in The Amazing Spider-Man, as Peter Parker (Andrew Garfield) becomes Spider-Man and balances being a superhero doing battle against the villainous Lizard alongside his developing relationship with Gwen Stacy (Emma Stone). Then, when Spider-Man's new enemies - including the powerful Electro - unite in The Amazing Spider-Man 2, Peter Parker finds that his greatest battle is about to begin.